An engaging crime thriller where a winemaker living a world away from his London childhood can't escape his past life on the periphery of one of the East End's most brutal gangs. Waikato author Julie Thomas had an auspicious authorial start: her self-published debut, the historical novel THE KEEPER OF SECRETS, made a big splash and sold tens of thousands of copies, leading to Thomas and her book being snapped up by a major publisher. 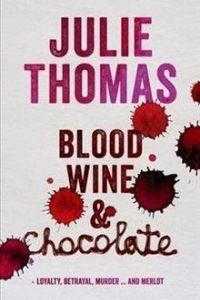 With BLOOD, WINE & CHOCOLATE, Thomas shows a deft hand for writing in multiple genres as she spins an intriguing crime tale in this, her sophomore effort. Described as 'blackly comic', BLOOD, WINE & CHOCOLATE is certainly a tale with moments dark and light, though 'comic' might be a bit of a stretch. There is a definitely a sense of lightness or fun in some parts, maybe even veering towards pleasant farce in a couple of incidents - particularly the latter half of the book when we shift from London's gritty East End to rural New Zealand. Oenophiles and gastronomes (sorry, that's a bit pretentious - winelovers and foodlovers) may love the way Thomas sprinkles the book with food and wine references; I certainly enjoyed the way wine and chocolate, in particular, swirled through what is a very readable tale. Former East End semi-hard nut Vinnie Whitney-Ross has found middle-aged bliss as a Waiheke Island winemaker married to his chocolatier sweetheart, an idyll a world away from his former life on the periphery of one of London’s most psychotic gangland families. But his Kiwi lifestyle dream was bought with the betrayal of a childhood pal who won’t forgive or forget, and soon Vinnie faces a collision between lives old and new. There will be blood… and wine, and chocolate. Thomas unfolds her tale chronologically, starting with Vinnie's upbringing in London. She skilfully evokes the gritty violence of his East End life before switching gears as he straightens up and moves from small-time hood to loved-up wine merchant. I found the early parts of the book pretty gripping in places, particularly Vinnie's interactions with childhood friends who were the progeny of gangsters, and would grow up to become even bigger villains themselves. Vinnie's understanding of where he fit in the picture, and Thomas's evocation of the way such men blended brutality and callousness on the one hand, with care and love for some things on the other, was pretty fascinating. Straightforward and enjoyable storytelling. But Vinnie's laissez faire approach to his childhood buddies is tested when he witnesses a crime, and can't find a way to wiggle himself out of his involvement. This leads to the decision to put an a couple of oceans between himself and those who want him dead, setting up in New Zealand. The food and wine descriptions become more mouthwatering as the book progresses - even if both wine and chocolate become weapons as much as enjoyable sustenance at times. Sometimes the pacing of the book can seem a little off, but it is a relatively smooth. and definitely enjoyable read. Overall, to put it in wine terms, BLOOD, WINE & CHOCOLATE is a crime thriller that doesn't quite hit the heights of the best vintages, but is a nice quaffable you'll likely be pleased you chose from the shelf.